Here is the Procedure, Example VBA Syntax and Example VBA Macro code for Appending an existing text file in Excel VBA. This will help you to know how to append a text file and add data using VBA. Here is the VBA code and syntax for Appending an existing text file Using VBA. Use the Append keyword to open text file in appending mode. Please follow the below steps to execute the VBA Code to Append an existing text file using Excel VBA Editor. Starting the program and sub procedure to write VBA Code to Append an existing text file and adding the data. Assigning the Existing File path to the variable strFile_Path. 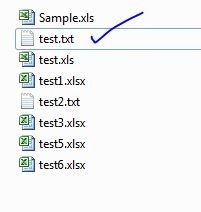 Ending the Sub procedure to write VBA Code to Append an existing text file and updating the data. ‘Assigning the Existing File path to the variable strFile_Path. ‘Ending the Sub procedure to write VBA Code to append the data in existing text file. Does anyone have a solution of how to capture the content on a cell (say a1) instead of “This is my sample text”? I am getting the string in quotes i.e “my text here” . How do I remove that so that I just have ‘my text here’ in the text file?